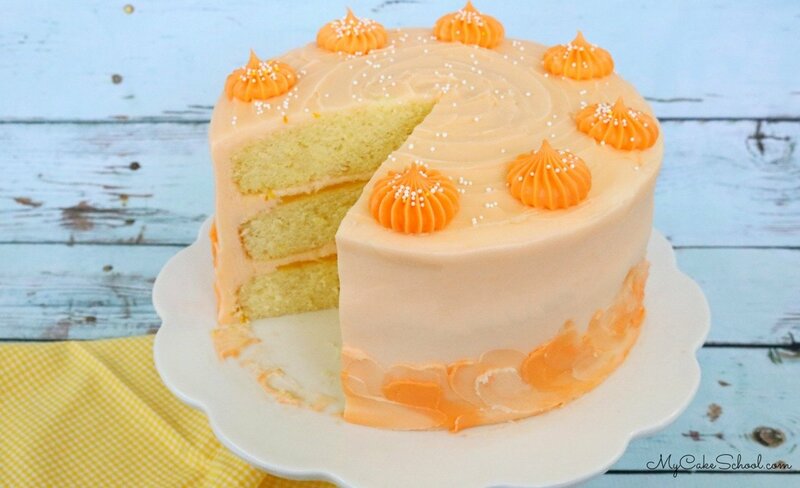 Every spring, I crave all of the fruit flavored cakes– and this DELICIOUS scratch Lemon Orange Layer Cake is a new favorite! If you like citrus, you’re about to fall in love. 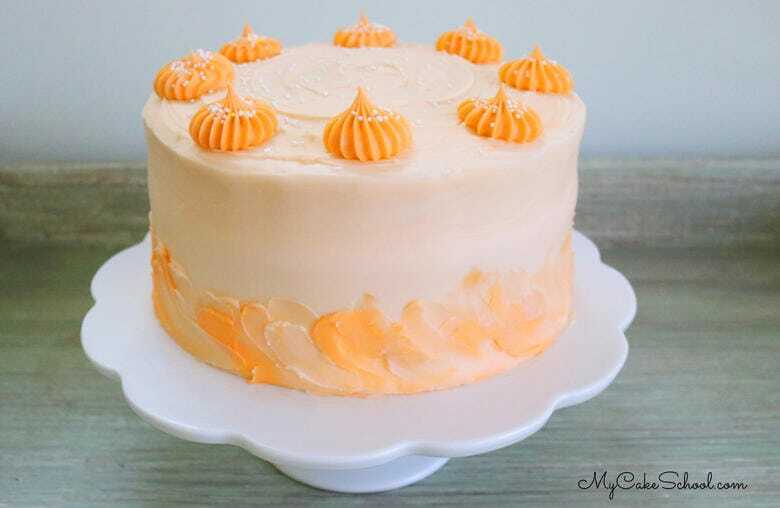 Homemade orange curd and orange cream cheese frosting are sandwiched between three layers of lemon cake, and frosted with orange cream cheese frosting in this heavenly dessert! 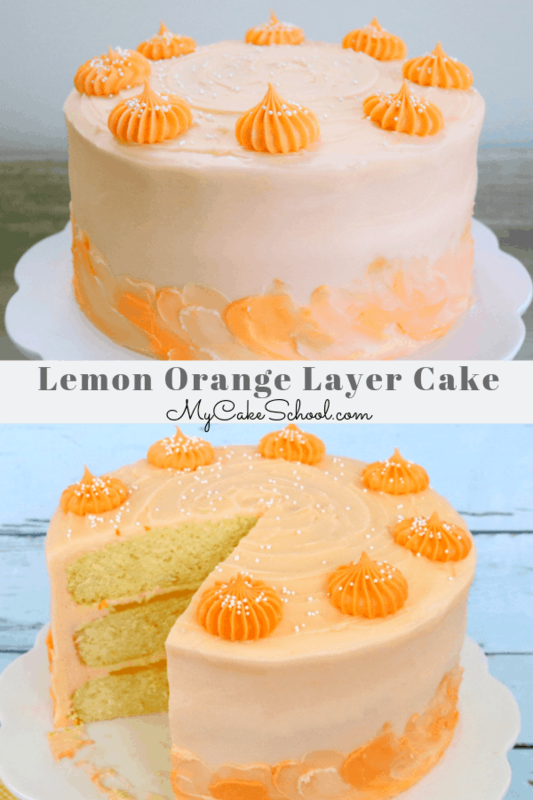 This Lemon Orange Cake is actually a fusion of two of our most popular cake recipes on our site– our scratch Lemon Cake recipe, and our Orange Dreamsicle Cake. We’re using our favorite scratch lemon layer cake recipe along with the Orange Cream Cheese frosting from our Dreamsicle Cake. The Orange Curd filling is a new recipe for us, and is bursting with lemon and orange flavor thanks to the orange and lemon zest as well as freshly squeezed orange juice! Altogether, this is the PERFECT cake recipe for spring and summer entertaining! We started by dividing our lemon cake batter between three 8 inch cake layers and baking until a toothpick could be inserted and removed with only a few crumbs attached. (Another good test for doneness is when the centers spring back after being lightly touched). Next, we cooled the cake layers for about 10 minutes on cooling racks before flipping them out of their pans & wrapping and freezing the layers while still warm. This is an optional step, but something that we always do when time allows because it makes the cakes even more moist. Freeze for at least a few hours (but cake layers can be frozen for up to three months as long as they are tightly sealed.) Thaw (at least partially) before unwrapping. 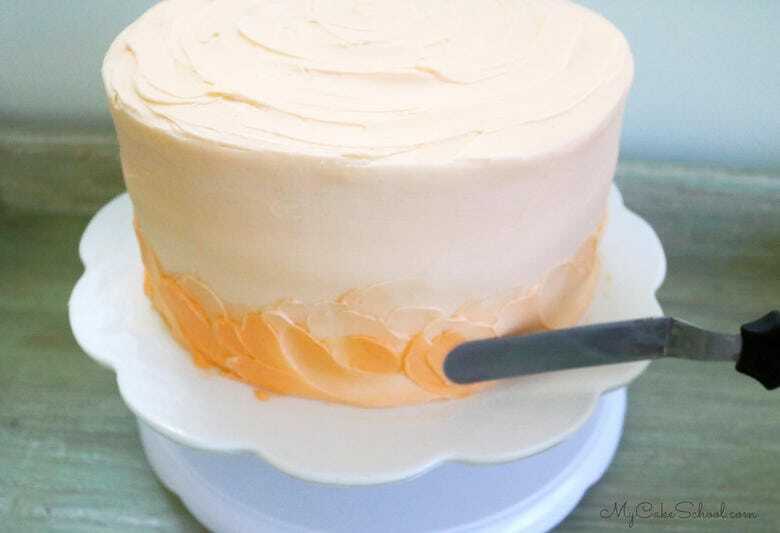 When it’s time to assemble, place the first cake layer on the pedestal or cake board and pipe a dam of orange cream cheese frosting about 1/4 inch from the edge of the cake. You can either snip the tip away from a disposable piping bag to apply the dam, or use a medium sized round piping tip. Next, spread a layer of orange curd within the dam. (The purpose of the dam is to prevent the filling from oozing out when the layers are stacked. Our orange curd is fairly thick but it’s easy enough to add a dam just in case. This orange curd is SO good! We actually use just a little bit of lemon in our orange curd for an added boost of flavor. However, when you taste it, orange is the flavor that comes through. Because we love this orange cream cheese frosting recipe so much, we spread a little on top of the curd as well. Just the curd alone as a filling would be delicious! Quick Tip! You’ll be tempted to slather on a thick layer of orange curd and a thick layer of orange cream cheese frosting in between the layers because they just taste SO gooood– but don’t go too thick! As a general rule, the thicker your cake filling, the more prone your cake will be to bulging later. All cakes settle a little bit. This means that after a cake is filled and layers stacked, the cake will settle and become slightly shorter over time. If you frost your cake immediately after filling, the settling of your cake will likely cause bulging which is noticeable around the sides of the cake, usually between the cake layers. There’s an easy solution for this. Before frosting my cakes, I like to wrap my filled cake layers with plastic wrap and put a small weight on top– this may be a cake pan or two (same size as the cake)…or lightweight book…anything that will give a light pressure. Do this for a few hours or overnight (chill in the refrigerator since the filling is perishable). At the very least, if you don’t have a few hours to spare, just gently push down on your cake for several seconds at a time before applying the final coat of frosting. Fill in any gaps between your cake layers that you may have with the orange cream cheese frosting and apply your crumb coat, then your final coat of frosting. **If your cake layers seem to slide a little as you apply your frosting (as can sometimes happen in cakes with soft fillings), pop it in the freezer for about 15 minutes or so to firm things up. This will make things much easier! The freezer is our friend. 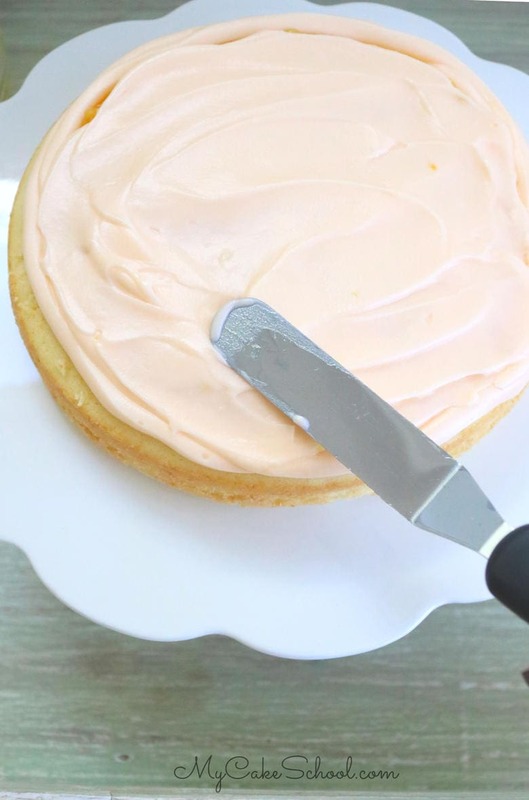 After smoothing the orange cream cheese frosting around the sides of the cake, I used my small rounded offset spatula to add texture on top as well as around the base of the cake. I tinted some of the remaining frosting a darker shade of orange and applied both light and darker shades of the frosting around the base of the cake bit by bit for added texture and color. This is a great alternative to a piped border and I love the look! All finished! We piped accents around the top of the cake with our Wilton 6B tip, and threw on a few white sprinkles here and there (nonpareils) just for fun. Here’s our cake after slicing, in all of it’s orange and lemony goodness! Doesn’t this cake just look like summertime? We hope that you enjoy this recipe! Your friends and family are sure to ask for it again and again. Don’t miss our full collection of the best cake and frosting recipes in our Recipes Section! If you’re looking for spring and summer fruity desserts in particular, make sure to check out our Roundup of Favorite Cake Recipes for Spring and Summer! 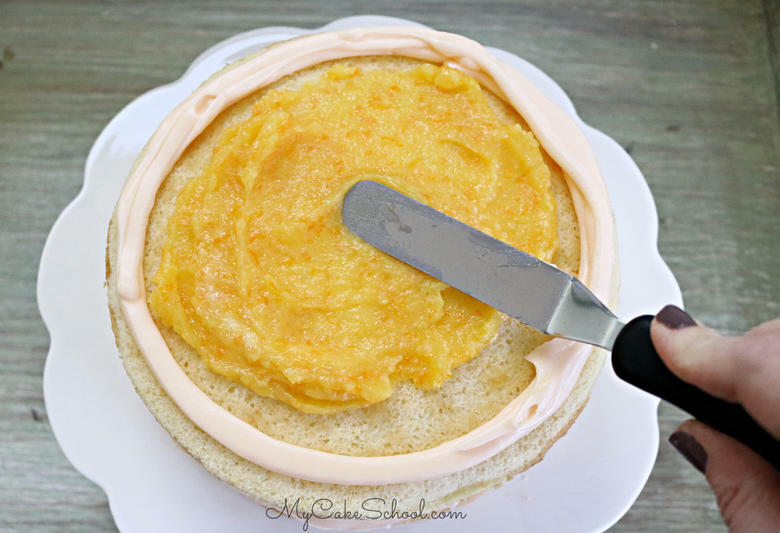 This Lemon Orange Cake recipe is so moist and bursting with citrus flavor! *** Substitution: If you don't have cake flour, for each cup of all purpose flour (or plain flour in the UK) remove 2 Tablespoons of flour and replace with 2 Tablespoons of cornstarch. For this recipe, measure out 3 cups all purpose flour, remove 6 Tablespoons and replace with 6 Tablespoons cornstarch. Whisk to blend. 3 sticks (1.5 cups) (339 g) unsalted butter, let it sit out approximately 10 minutes. It should feel very cool to the touch. 3 (8oz) packages cream cheese (total weight 678g), slightly softened. Use full fat cream cheese as reduced fat will be too soft. Grease and flour three 8 inch pans. Wash and dry the oranges and lemon — then zest all of them. It is best to use a microplane, being careful to get just the outside not the white beneath. In a sauce pan add the sugar cornstarch, egg yolks, orange and lemon juice and zest and butter. Stir to blend. Cook on medium low heat, stirring until ingredients are smooth and well combined. Increase to medium heat and stir constantly until the mixture begins to thicken and bubble. Reduce heat and stir for about a minute more- it will take on a pudding-like thickness/consistency. Remove the sauce pan from the heat. Pour curd into a heat proof bowl. Allow to cool 15 minutes, press a piece of plastic wrap onto the top of the curd to prevent a "skin" from forming. Refrigerate until cool, the curd will thicken further as it cools. The curd can be refrigerated for a week. When ready to use, remove from the refrigerator and allow to warm a bit and stir for easier spreading. It can also be frozen for 3 months. Cut the slightly softened cream cheese into pieces and add to the butter, beating at low to medium speed until incorporated. To assemble the cake, I piped a dam of orange cream cheese frosting about 1/4 inch from the edge of the cake layer, then filled with a layer of curd, topped with a layer of cream cheese frosting. Repeat, then frost as usual. If your orange cream cheese frosting is too soft, you can add more powdered sugar, and you can also chill it as needed to firm it up for frosting the cake or piping. Sounds great, but I’ve always wondered how you can wrap warm cake layers with plastic wrap without having the cake stick to the wrap .. a LOT. Can you give some advice about this? Do you wrap all your cakes while they are warm before freezing or just for some of your recipes? I’m looking forward to making this cake next week, it sounds delicious! One last question. I store my buttercream icing in the refrigerator and use it within one week of making it (preferably 2-3days) How long will cream cheese icing hold up and does it freeze well? Hi Kathy, Freezing the layers is an optional step but we usually wrap each layer while still warm and freeze. We think it makes the cake more moist. Wrap in plastic wrap then aluminum foil, important that they are air tight. Cream cheese can be refrigerated several days as long as the cream cheese is not near the expiration date. When ready to use let it sit out 1 hour to soften. Cream cheese frosting can also be frozen. I’m not sure of the definite time but 2 months should be fine. Frozen cream cheese frosting will need to defrost in the refrigerator before moving it to the countertop.